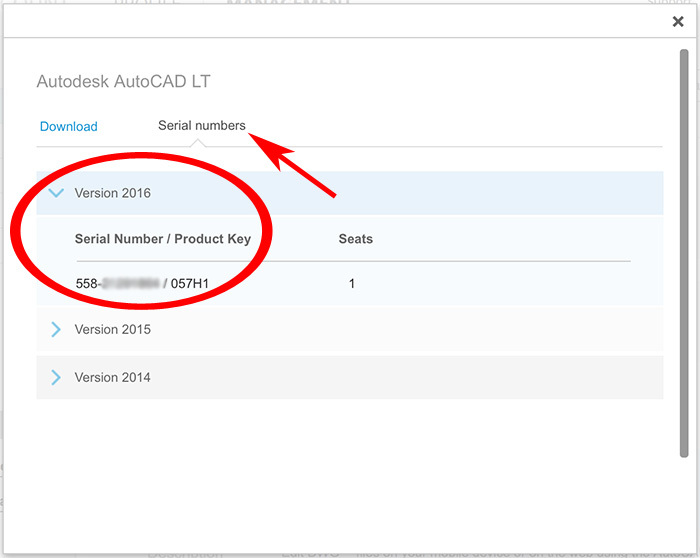 Your Serial Number and Product Key are displayed in your Autodesk Account in the product tray on the Products & Services page and also again in the Software Download window. Note about serial number visibility in Autodesk Account: Only account administrators, such as Contract Managers and Software Coordinators, and Named Users with assigned software benefits will see serial numbers in Autodesk Account. You are the account administrator if you purchased a software subscription using your Autodesk Account or were assigned the role of Contract Manager or Software Coordinator by your company. If you do not see the software you wish to activate in your Autodesk account or see the message "Contact your admin for serial numbers," you need to contact the contract administrator. Only an administrator can assign you as a Named User or End User and give you permissions to download and activate the software. Click Downloads to initiate a download and see the serial number in the download window.